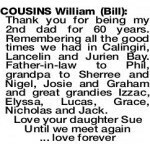 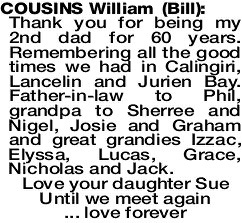 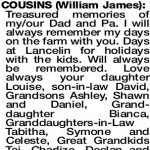 In loving memory of Bill, Husband to Norma, Father to Sue, Rod (dec), Dorise, Louise and Lisa. 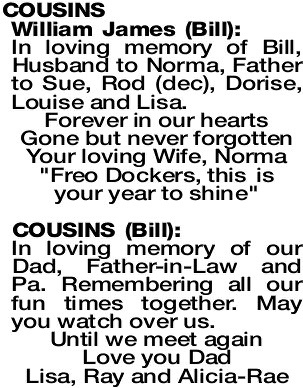 Forever in our hearts Gone but never forgotten Your loving Wife, Norma "Freo Dockers, this is your year to shine"
In loving memory of our Dad, Father-in-Law and Pa. Remembering all our fun times together. 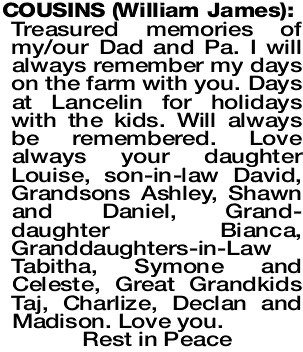 May you watch over us.